Obesity is defined as an excessive increase in body fat. The threshold from being overweight to being obese lies at a body mass index (BMI) of 30. Today, obesity is not considered a normal variation but rather a chronic disease which is associated with an increased morbidity and mortality risk. 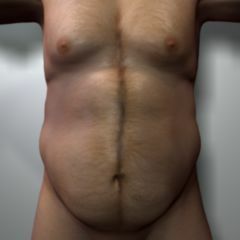 Android obesity: male pattern of fat distribution, also called visceral or central obesity (apple type). Fat is located mainly on the abdomen. Gynoid obesity: Female pattern of fat distribution with emphasis on the hips, also called peripheral obesity (pear shape). 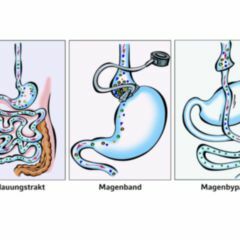 The type of obesity is assessed by calculating the waist-to-hip ratio (WHR). 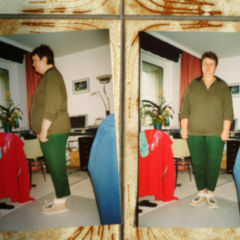 Obesity is diagnosed by calculating the patient's BMI, using height and weight. Another important factor besides the mass of fat is its distribution, as it determines the metabolic and cardiovascular risk. A simple method of assessing fat distribution is measuring the waist circumference to estimate the mass of visceral fat. By a definition of the WHO, abdominal obesity is present if the circumference exceeds 88 centimeters (women) or 102 centimeters (men).